The Birmingham NEC Homebuilding & Renovation is now underway until Sunday 17th April. Come and see us on Stand C101 – Hall 9. 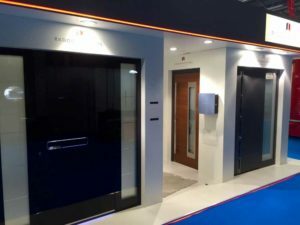 We have some amazing Aluminium doors on the RK Door Systems stand from Black Glass Pivot doors with a matching letter box to a door with a timber and stainless steel handle with a digital door viewer built into it. For those tech inspired people – we have a couple of the front doors hooked up to our new App system where you can open your door with a swipe of a finger from your smart phone. We also have many doors with Finger print entry built into the doors. New this year, we are launching fire rated security doors, perfect for flats, apartments and offices – something different to your standard doors. We have a white glass with stainless steel one for you to see. There is a door for everyone whether you want something different from your neighbour or a more traditional, classic looking door… We can assist you in choosing your stunning entrance door. Come and meet one of the team where we will be pleased to help.